ASK meets the second Thursday of each month and is a casual gathering designed for people who have had, or may be facing an amputation. Friends and family are always invited. Our purpose is to provide information, answer questions and allow people to share information and experiences. And we had a great one. For the BBQ, it was the very Best. Thank you to all the members and Family in attendance. Everyone seemed to enjoy the day, even if it was quite warm. The turnout for our first annual picnic was good, I'm sure next year will be even better. Our list of speakers seems to be coming along very well, we are looking forward to hearing from a prosthetic manufacture, a teacher of Tai-Chi. (very good for balance training) also PT’ and OT therapist. Anyone wishing to add to our news letter, please send me an e-mail and I will do my best to see that it is posted.
. Amputees Sharing Knowledge is a casual gathering designed for people having had or facing an amputation. Friends, family or anyone else interested is invited. Our purpose is to provide information, answer questions and allow people to share information and experiences. Wilmington Orthotics and Prosthetics is pleased to welcome Jessica Bleau to our staff as office manager. Jessica is from Cherryville, NC and spent six years in the USMC reserves after high school. She is a Certified Medical Assistant and brings previous experience working in both orthotics and prosthetics as well as physical therapy settings. We are excited to have her join us! Wilmington Orthotics and Prosthetics will miss Bryan King as he begins a two year program for orthotic and prosthetic technicians. Brian starts classes August 27 at Century College in White Bear Lake, Minnesota. Brian has been volunteering with us for the past year to gain hands on experience prior to school. We wish Brian the best of luck and know he will be a great technician! 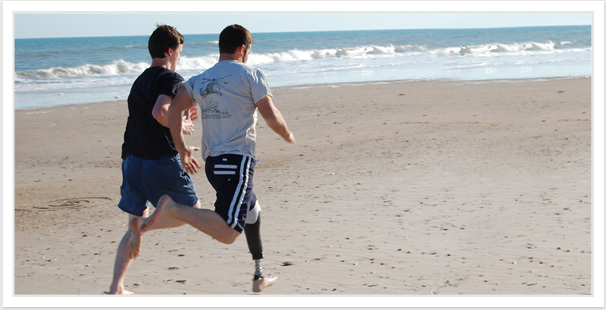 Frequently, Wilmington Orthotics and Prosthetics get involved in custom projects. About two years ago we were approached by Rick Hairston of Carolina Canines (www.carolinacanines.org) with a request to modify a dog harness. Carolina Canines is a local non-profit organization which provides service dogs free of charge. A service dog is individually trained to perform specific tasks for a person with a disability. Since placing their first dog in December of 1999, Carolina Canines has placed 38 service dogs. These dogs have gone to serve people with many different diagnoses including multiple sclerosis, muscular dystrophy, spinal cord injury, cerebral palsy and amputees. After looking at the needs of the dogs as well as their handler, our prosthetist/orthotist Jon recommended changing the overall design of the harness. He proposed a design with a handle which would lock in the upright position but also be able to fold. The folding harness would allow the dog to more easily fit under tables and desks when necessary, as well as make it easier to get in and out of vehicles. After a few prototypes, Jon ended up using Becker (www.beckerorthopedic.com) bale lock hinges with a cable release. This type of system is frequently used with long leg braces. The design worked perfectly and has been used with almost fifteen dogs so far.